We've been watching our second female goat like a hawk ever since we found Maddie in the barn a few weeks back. We've been watching for signs of labor hoping that we might actually get to watch the other Mama goat birth her baby. 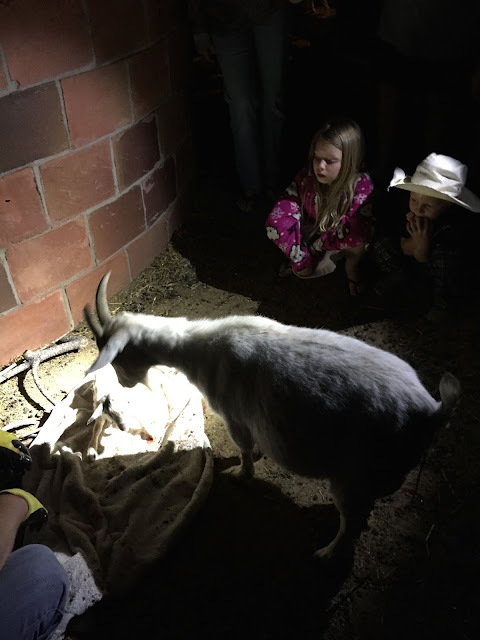 On Friday we had some friends over for dinner and they happen to be animal savvy, so we took them down to the barn to look at our Mama goat. When we walked in the pen it was OBVIOUS that she was in early labor. She had all kinds of stuff coming out of her backside and every few minutes she would lay on her side and you could see her whole middle contract. At 8:30 our friends went home and the Cowboy headed down to the barn to check on the Mama goat while the kids got their pajamas on. 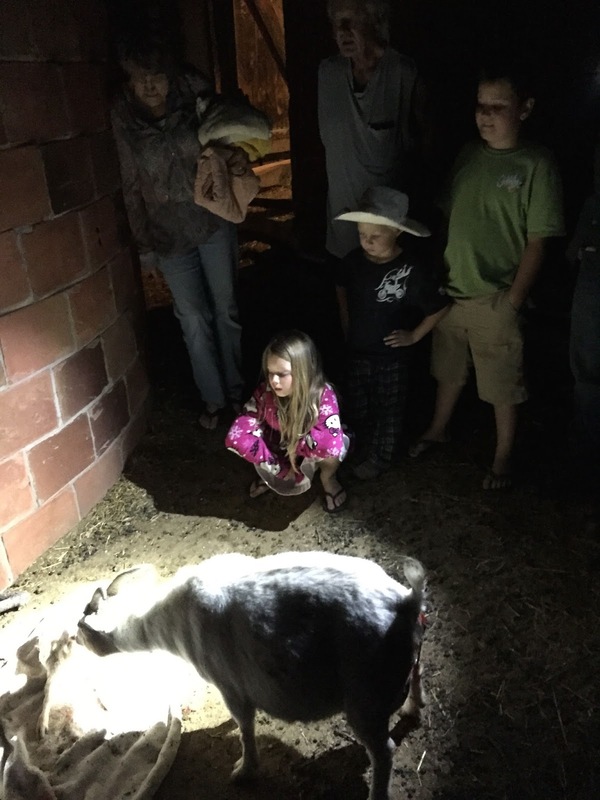 We told them that if they got ready for bed quickly they could all come down to the barn with us if they wanted to watch our newest "kid" be born. They were all rushing to brush teeth and slip on their flip flops (there is still a bit of CA in these country kids) when the Cowboy texted me and said, "It's coming now." Being the rather patient Mama that I am, I ran out the door and told the kids they could meet me down there whenever they were ready! LOL. It turns out there was no reason to run. We sat around for a couple hours and watched all sorts of strange things happen to our goat, but no baby was born. We finally decided to look up some info on the internet and discovered that our Mama goat, who had been pushing for several hours, probably just needed a little help. So Matt held the light and my brave Joey reached in to see if he could feel the baby and it turns out that it's hooves were right there just a little stuck. He adjusted them a little bit and then each time the Mama would contract he would pull very gently on the hooves. It only took a few contractions before the baby came out and it was seriously one of the absolute coolest things that I have ever seen in my life! She was born around 10:30 pm so the video is a bit dark... but it was amazing all the same. What I loved most about Friday night was all of us being there together, my Joey, my kids, my dad and Lori, and Matt. It's a memory we'll all have etched in our minds for a really long time. I never imagined this to be my life... To have so many of my own treasures... To live on land and look forward to spring each year when all our animals have their own babies. And I never expected that I would be so changed by watching our treasures learn so much about life through our animals. I didn't plan my life to look one iota like this. But now that we're here, I wouldn't change it for anything.